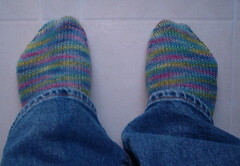 Nicole's Needlework: I finished my socks!! 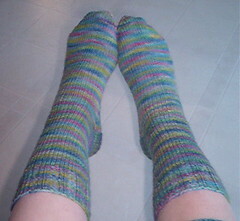 Can you tell I love these socks?? There are more pics in my Flickr album. Well, not much else going on here... I have been working on Gloria Some. I started on the back. 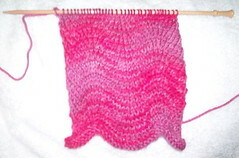 I love working with the Cashmerino, even if it does end up pilling! :) Whew! Didn't mean for this to be so long!!! 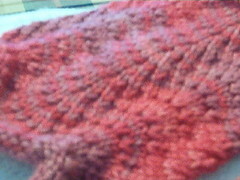 Better watch out Nicole - sock knitting is VERY addictive. 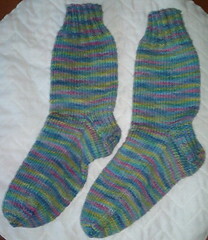 I have two pairs on the needles right now. Stay warm up there nearer the mountains.....hopefully the junk coming will be a minor nuisance.